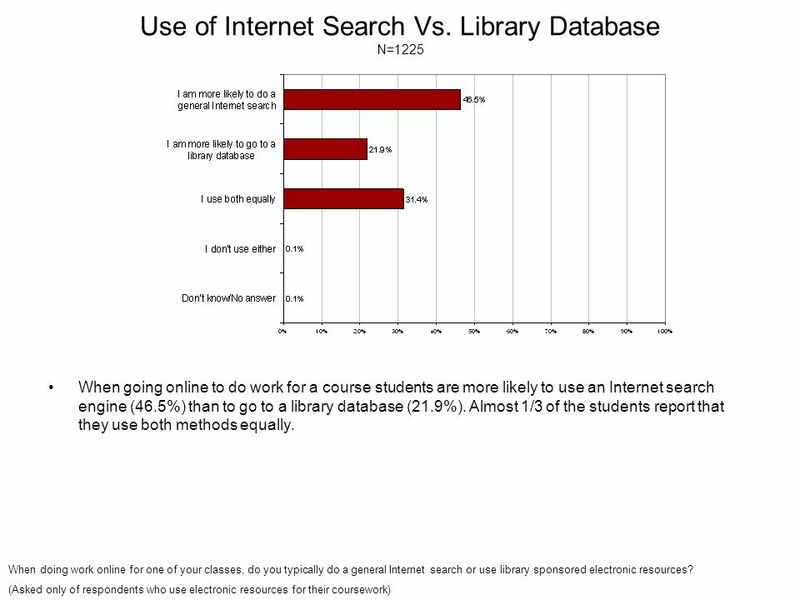 Student Survey 2003. 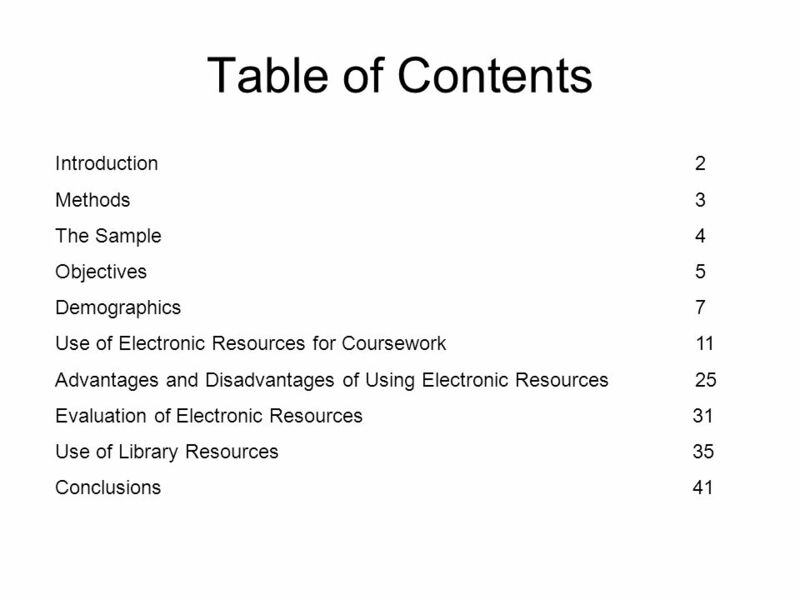 Table of Contents Introduction2 Methods3 The Sample4 Objectives5 Demographics7 Use of Electronic Resources for Coursework11 Advantages. 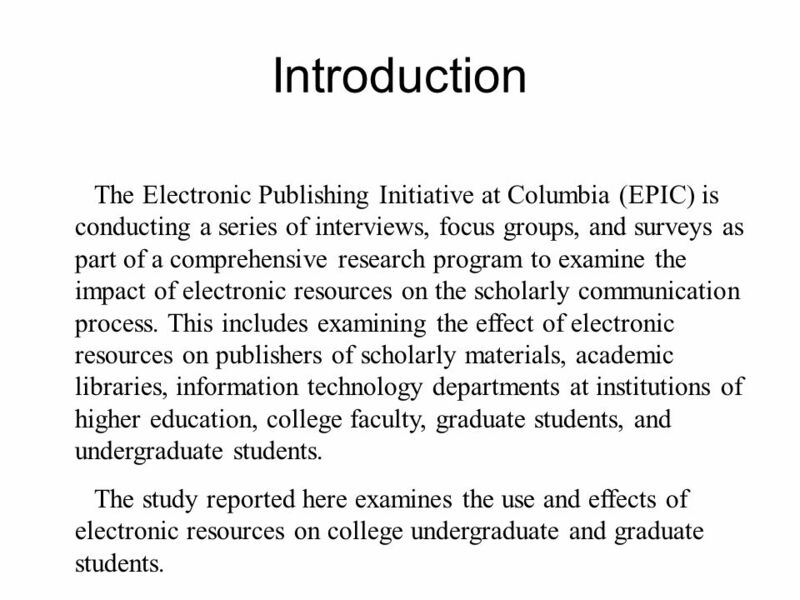 3 Introduction The Electronic Publishing Initiative at Columbia (EPIC) is conducting a series of interviews, focus groups, and surveys as part of a comprehensive research program to examine the impact of electronic resources on the scholarly communication process. 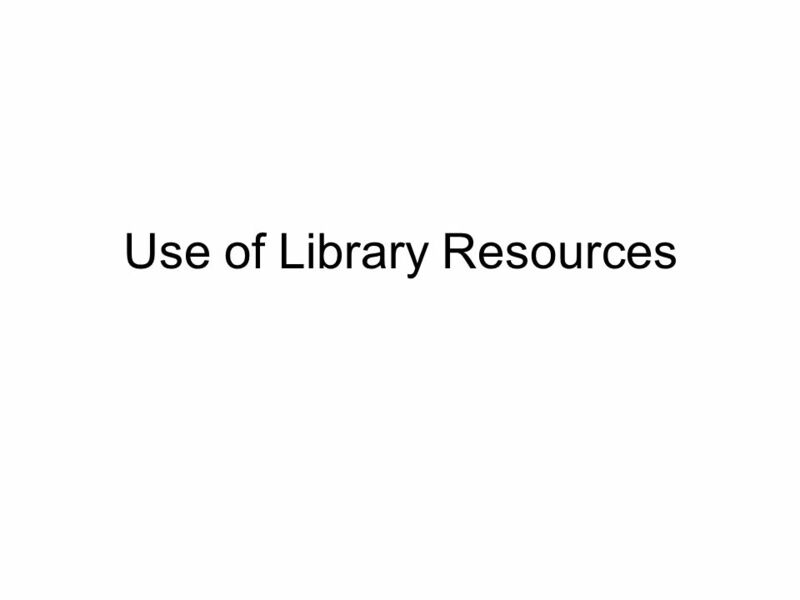 This includes examining the effect of electronic resources on publishers of scholarly materials, academic libraries, information technology departments at institutions of higher education, college faculty, graduate students, and undergraduate students. 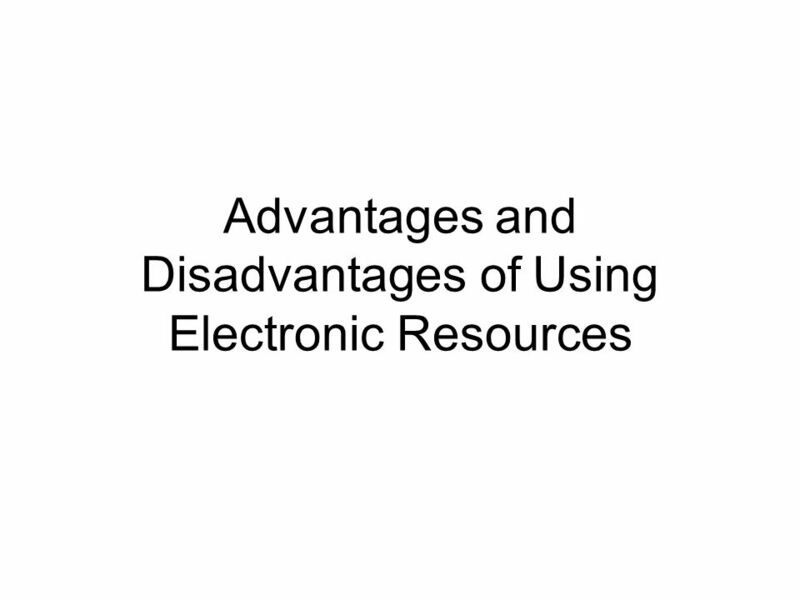 The study reported here examines the use and effects of electronic resources on college undergraduate and graduate students. 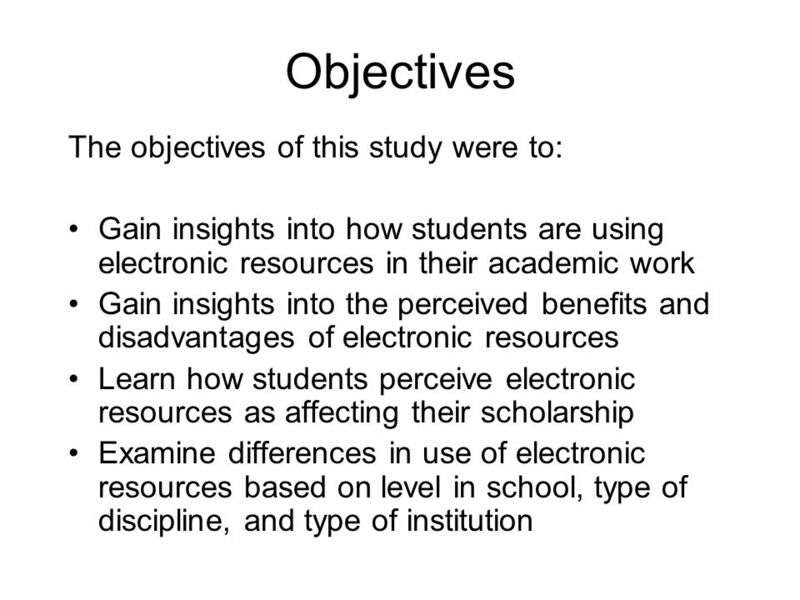 4 Methods A 25 minute online survey of college students was conducted in the Spring and Fall 2003 semesters. 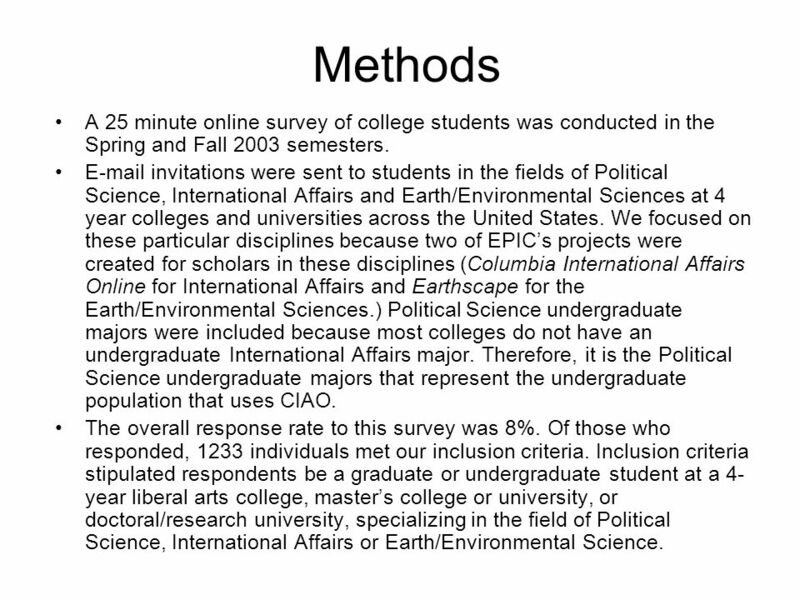 E-mail invitations were sent to students in the fields of Political Science, International Affairs and Earth/Environmental Sciences at 4 year colleges and universities across the United States. We focused on these particular disciplines because two of EPIC’s projects were created for scholars in these disciplines (Columbia International Affairs Online for International Affairs and Earthscape for the Earth/Environmental Sciences.) Political Science undergraduate majors were included because most colleges do not have an undergraduate International Affairs major. Therefore, it is the Political Science undergraduate majors that represent the undergraduate population that uses CIAO. The overall response rate to this survey was 8%. Of those who responded, 1233 individuals met our inclusion criteria. Inclusion criteria stipulated respondents be a graduate or undergraduate student at a 4- year liberal arts college, master’s college or university, or doctoral/research university, specializing in the field of Political Science, International Affairs or Earth/Environmental Science. 5 The Sample The original sample reflected the underlying distribution of students in four year liberal arts colleges and universities for gender, based on the last year of data available (1999). Weighting factors were used to match the sample to the population for control of school (public vs. private), and level in school (graduate vs. undergraduate) (1999, U.S. Department of Education, National Center for Education Statistics). This means that the sample matches the national demographics for undergraduate and graduate students in 4-year colleges and universities on gender, control of school attended, and level in school. We also distributed discipline so that it was represented as 50% Political Science/International Affairs and 50% Earth/Environmental Sciences. The findings from this study indicate general trends among undergraduate and graduate students, and may not necessarily be representative of every individual’s experience. 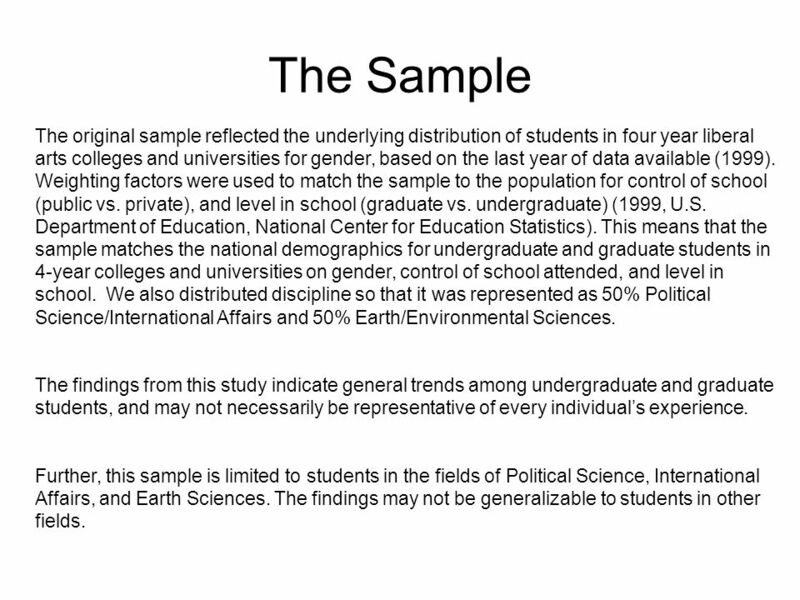 Further, this sample is limited to students in the fields of Political Science, International Affairs, and Earth Sciences. 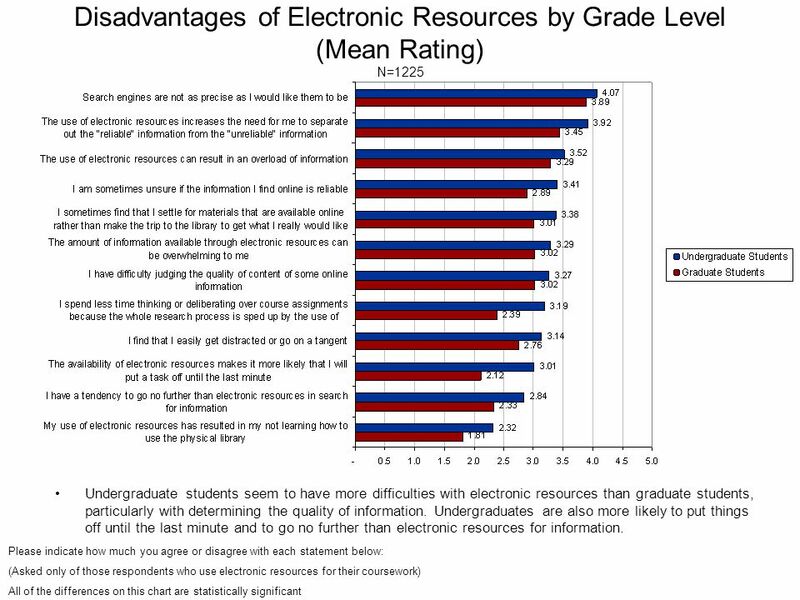 The findings may not be generalizable to students in other fields. 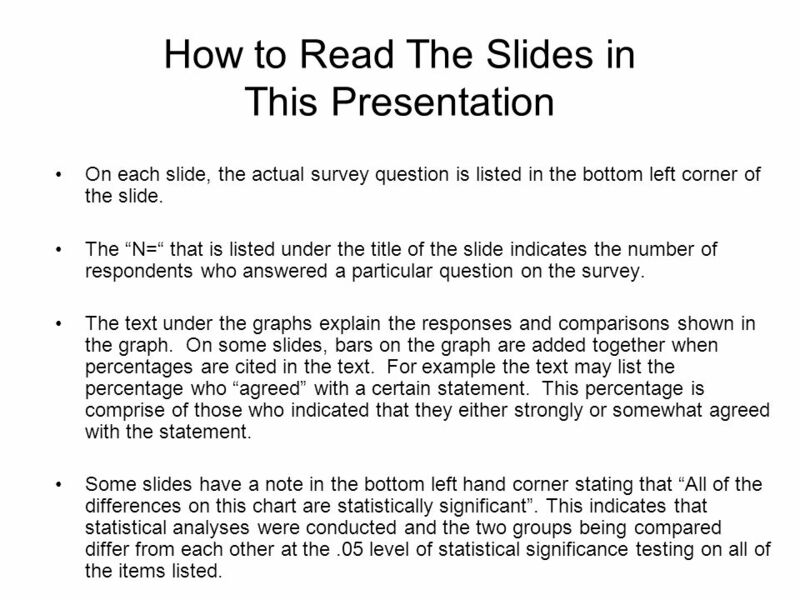 7 How to Read The Slides in This Presentation On each slide, the actual survey question is listed in the bottom left corner of the slide. 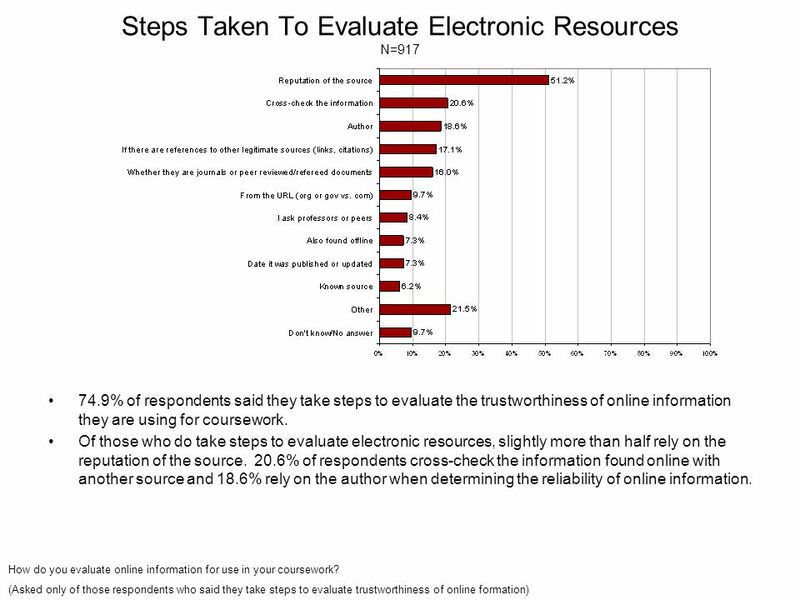 The “N=“ that is listed under the title of the slide indicates the number of respondents who answered a particular question on the survey. 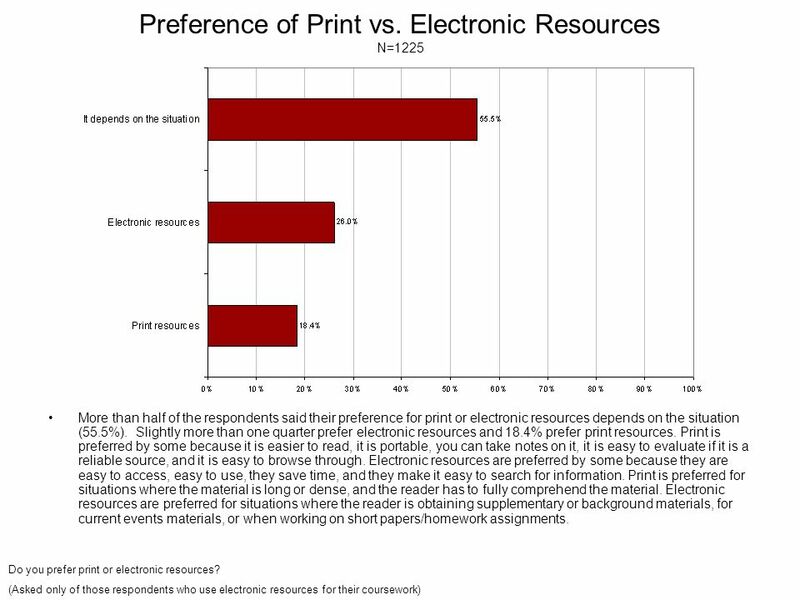 The text under the graphs explain the responses and comparisons shown in the graph. 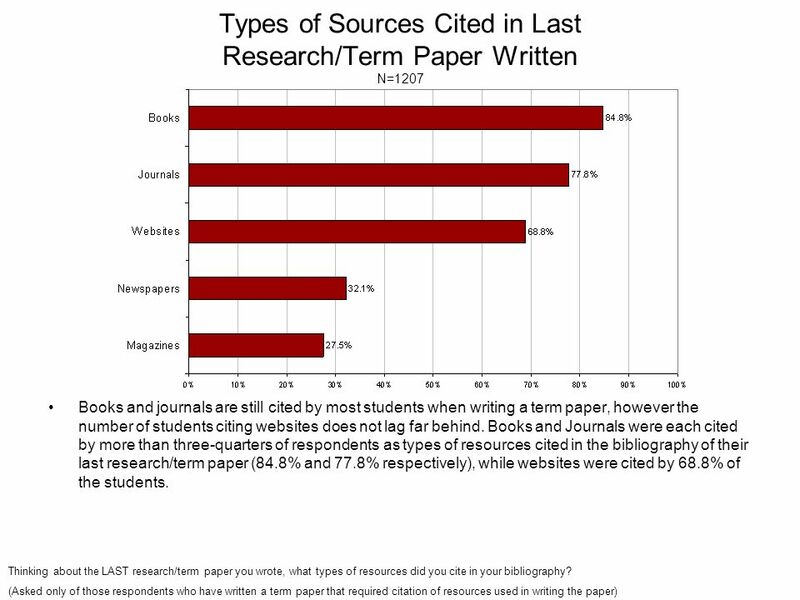 On some slides, bars on the graph are added together when percentages are cited in the text. For example the text may list the percentage who “agreed” with a certain statement. 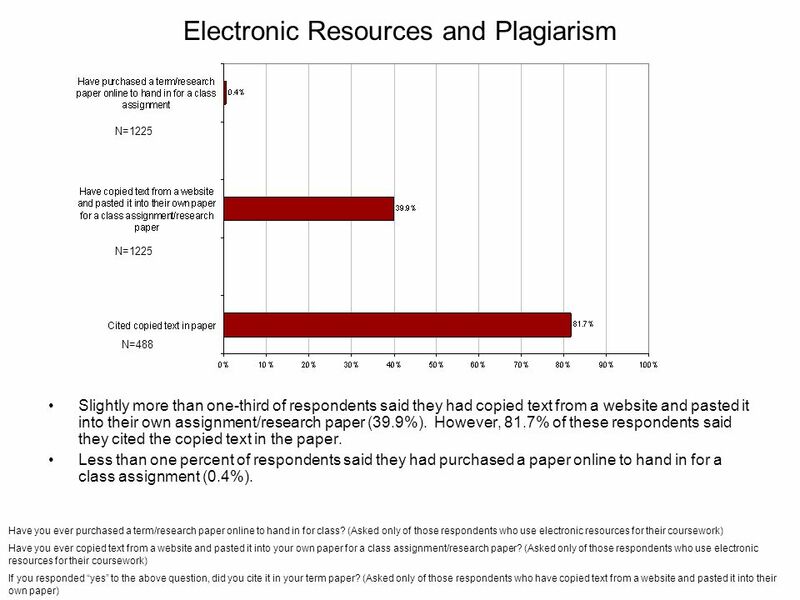 This percentage is comprise of those who indicated that they either strongly or somewhat agreed with the statement. Some slides have a note in the bottom left hand corner stating that “All of the differences on this chart are statistically significant”. This indicates that statistical analyses were conducted and the two groups being compared differ from each other at the.05 level of statistical significance testing on all of the items listed. 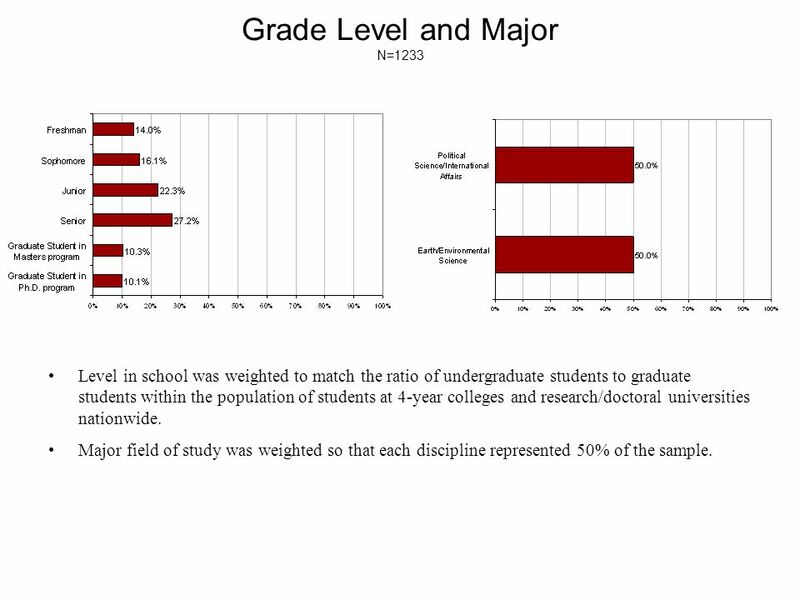 9 Grade Level and Major N=1233 Level in school was weighted to match the ratio of undergraduate students to graduate students within the population of students at 4-year colleges and research/doctoral universities nationwide. 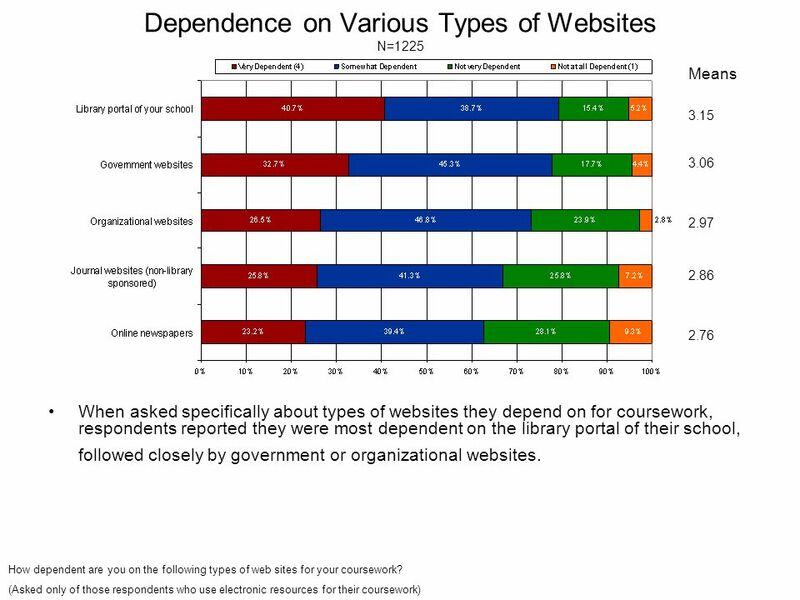 Major field of study was weighted so that each discipline represented 50% of the sample. 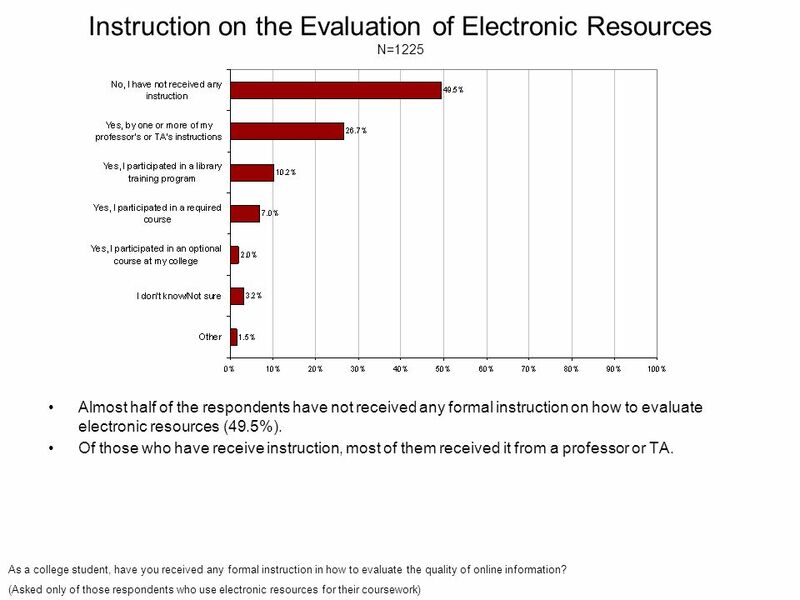 10 Type of Institution N=1233 The majority of respondents were from Doctoral/Research Universities (81.9%). Control of institution (public vs. private) was weighted to match the underlying distribution within the population of students at 4-year colleges and doctoral/research universities. 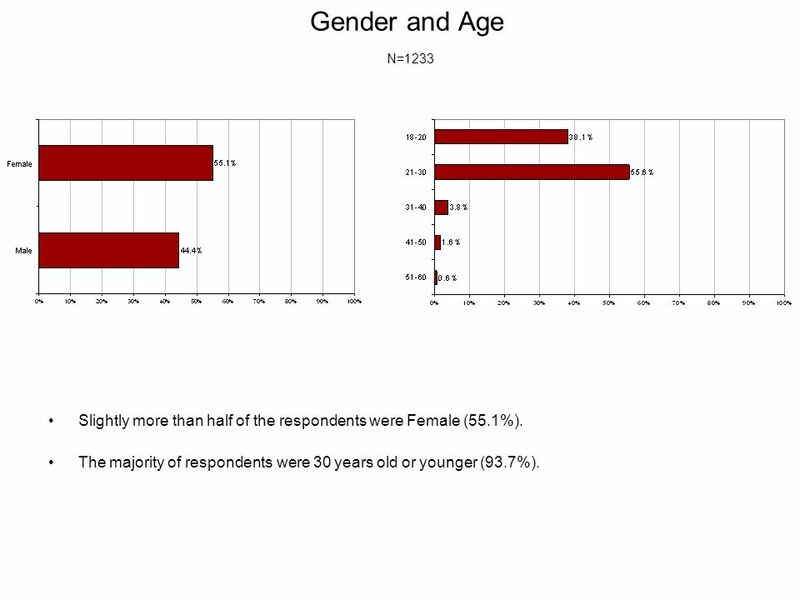 11 Gender and Age N=1233 Slightly more than half of the respondents were Female (55.1%). 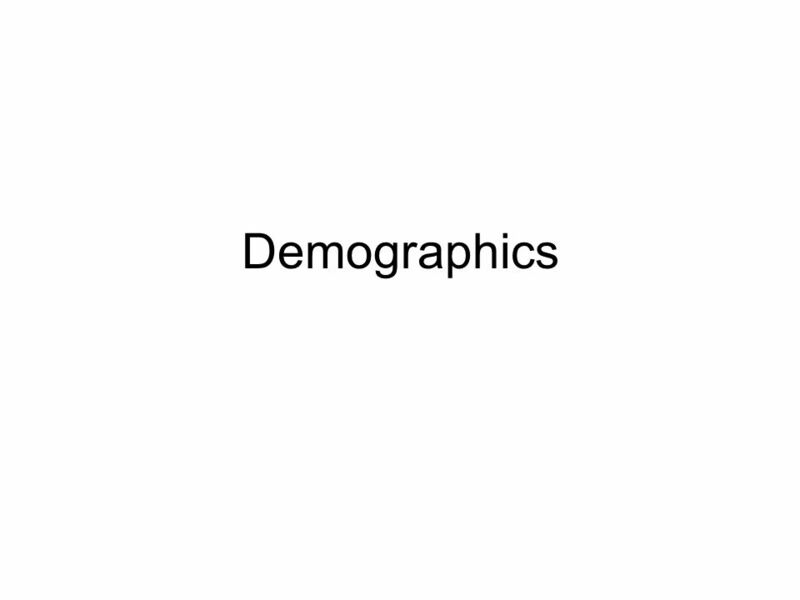 The majority of respondents were 30 years old or younger (93.7%). 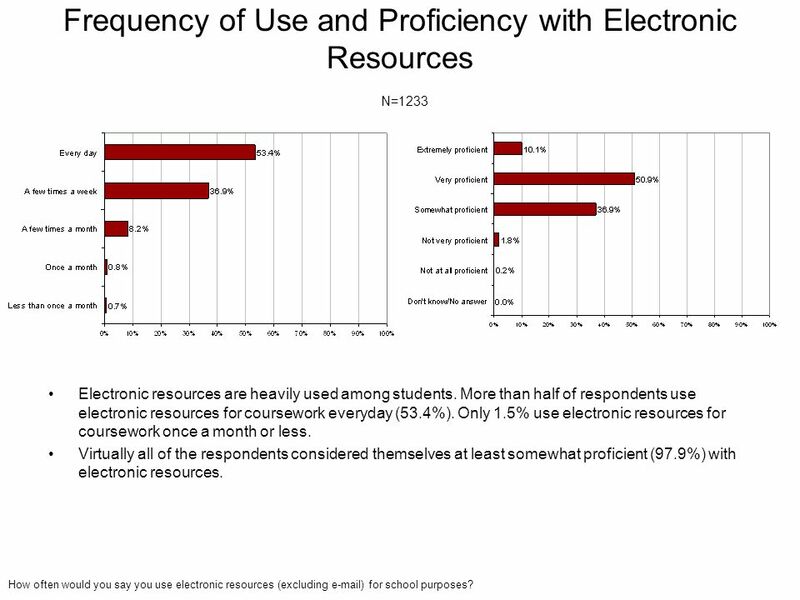 13 Frequency of Use and Proficiency with Electronic Resources N=1233 Electronic resources are heavily used among students. 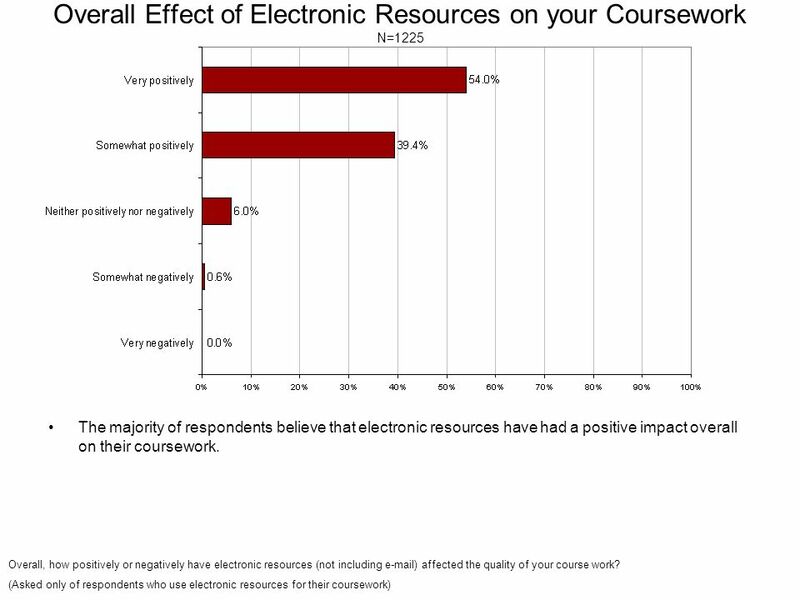 More than half of respondents use electronic resources for coursework everyday (53.4%). 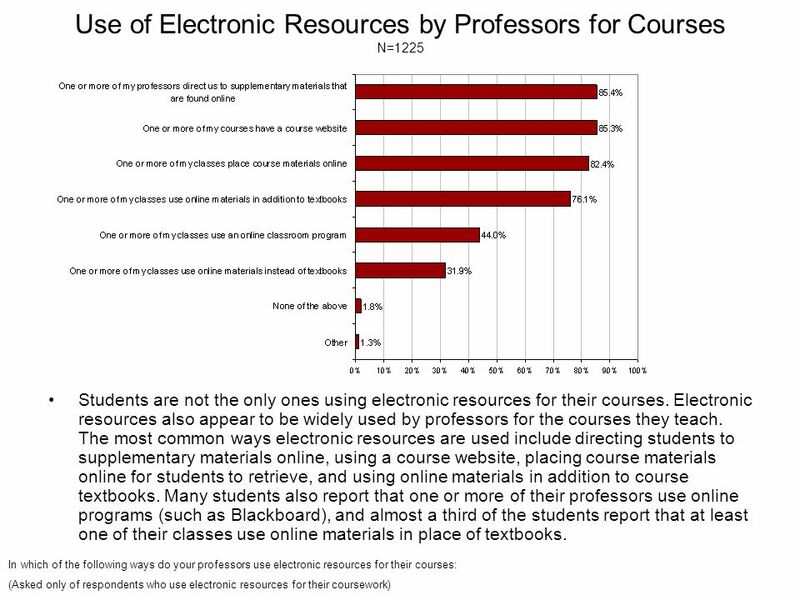 Only 1.5% use electronic resources for coursework once a month or less. 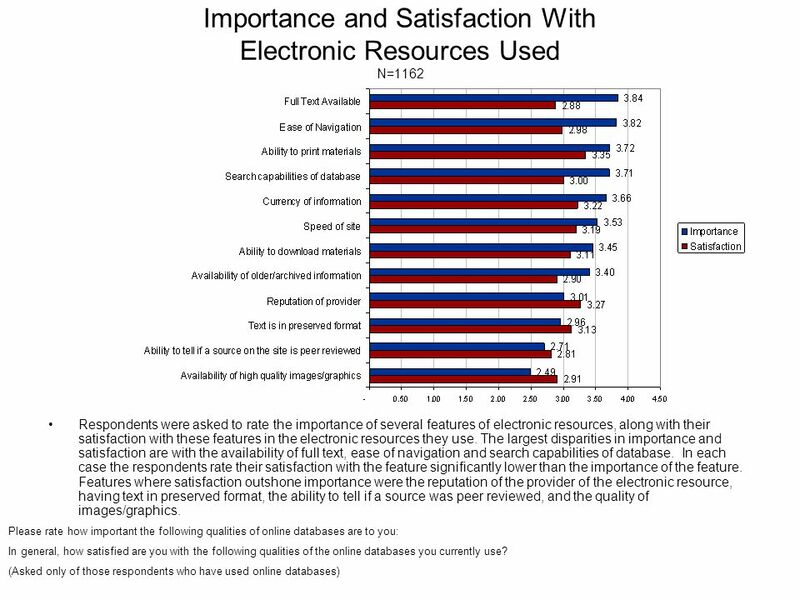 Virtually all of the respondents considered themselves at least somewhat proficient (97.9%) with electronic resources. 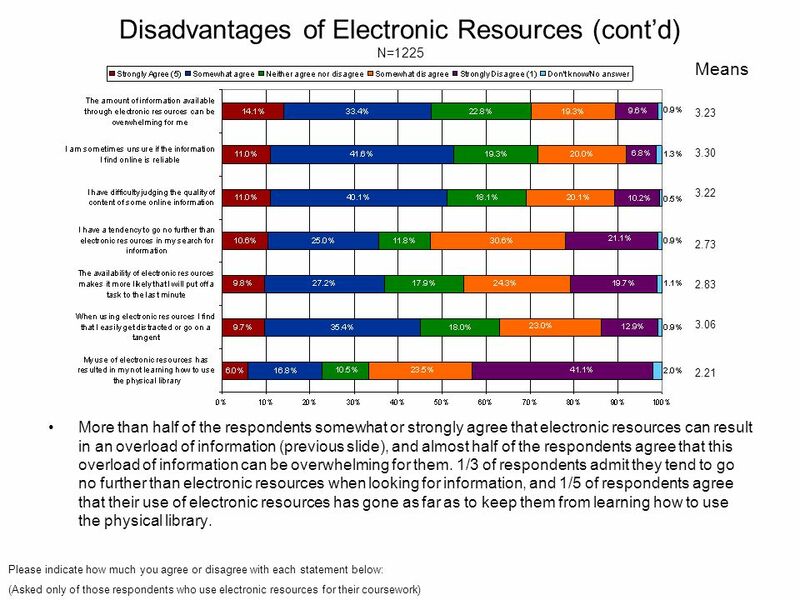 How often would you say you use electronic resources (excluding e-mail) for school purposes? 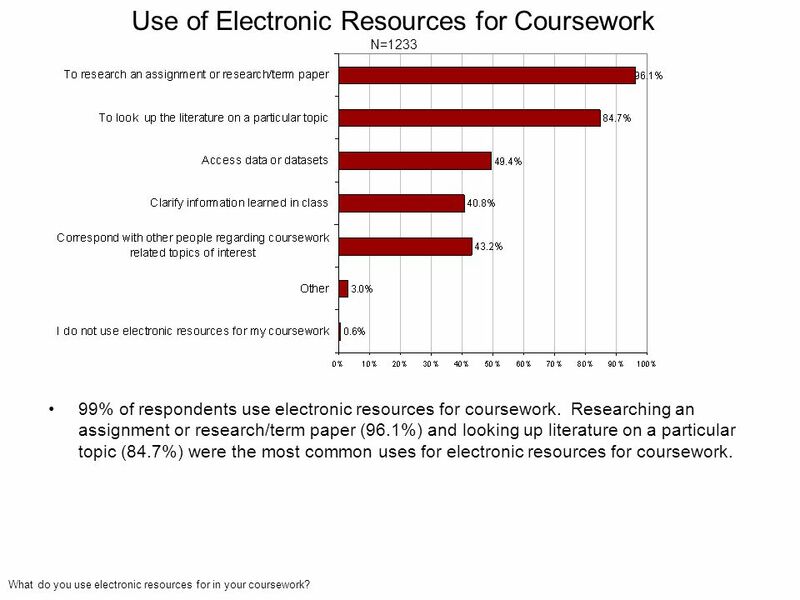 14 Use of Electronic Resources for Coursework N=1233 99% of respondents use electronic resources for coursework. 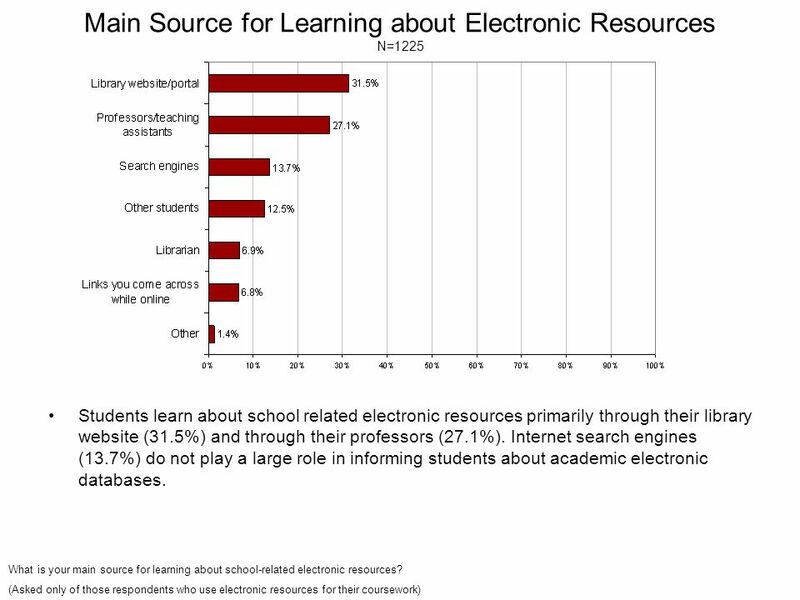 Researching an assignment or research/term paper (96.1%) and looking up literature on a particular topic (84.7%) were the most common uses for electronic resources for coursework. 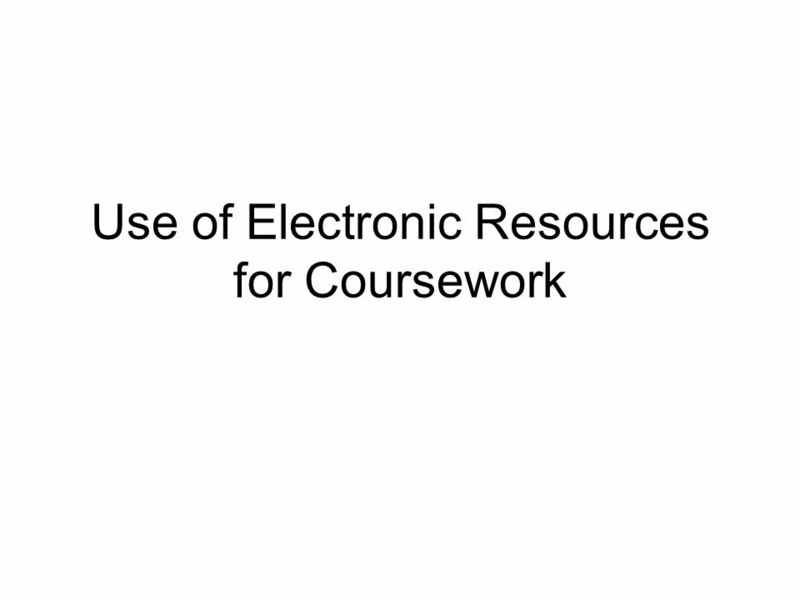 What do you use electronic resources for in your coursework? 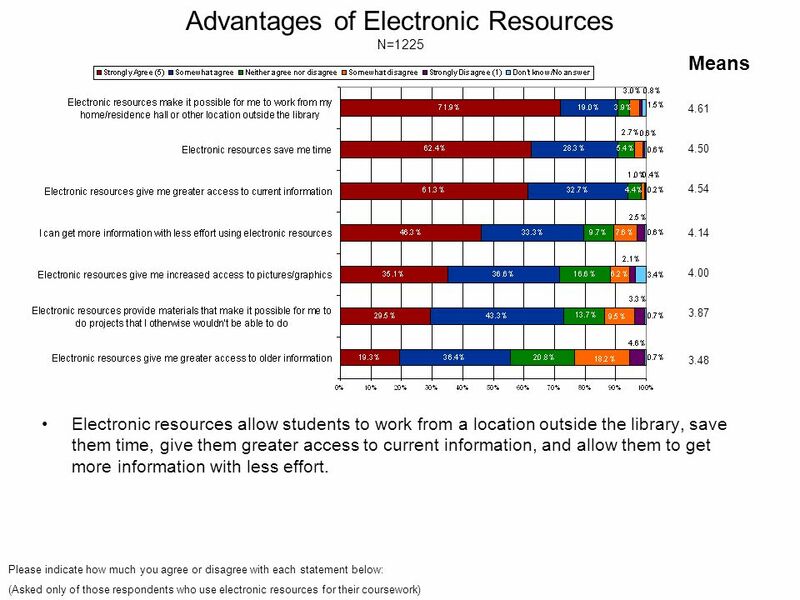 42 Conclusions Electronic resources have become the main tool for students’ information gathering. 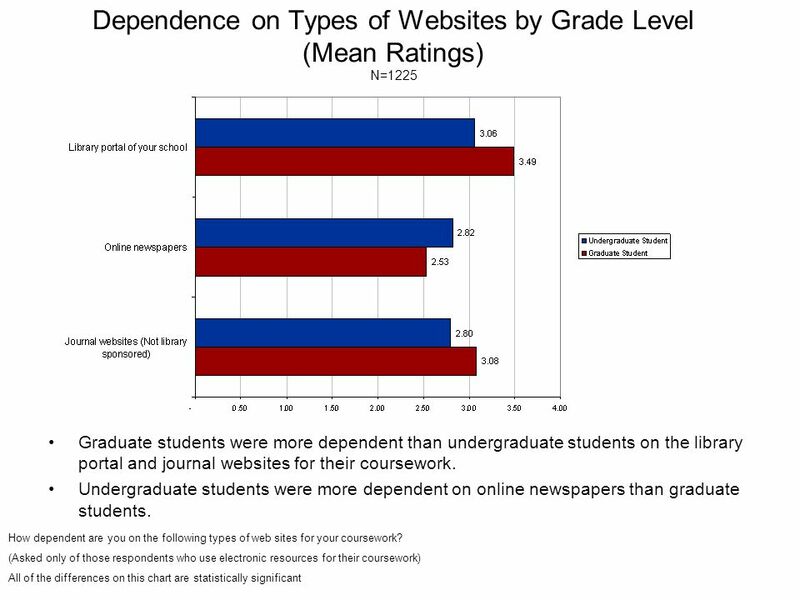 Undergraduate students in particular are heavily dependent on the World Wide Web. 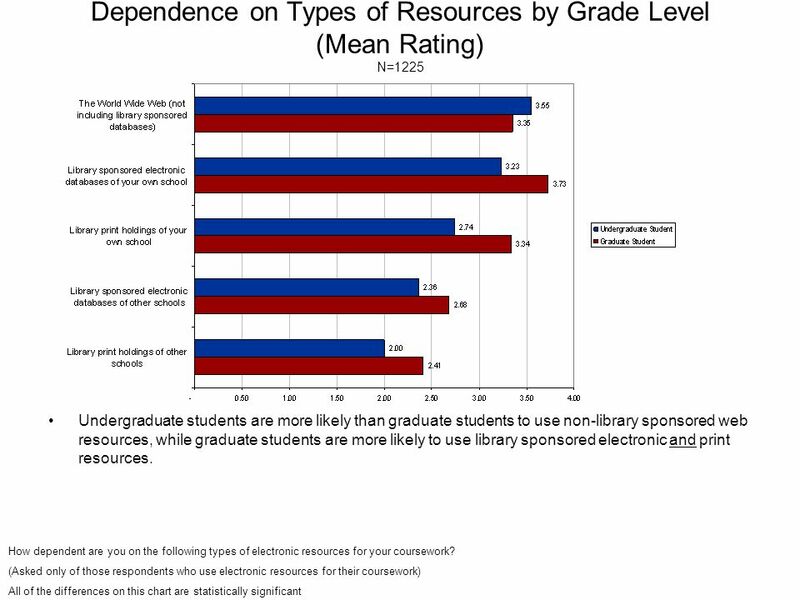 Graduate students are more likely to report a dependence on library sponsored electronic resources. 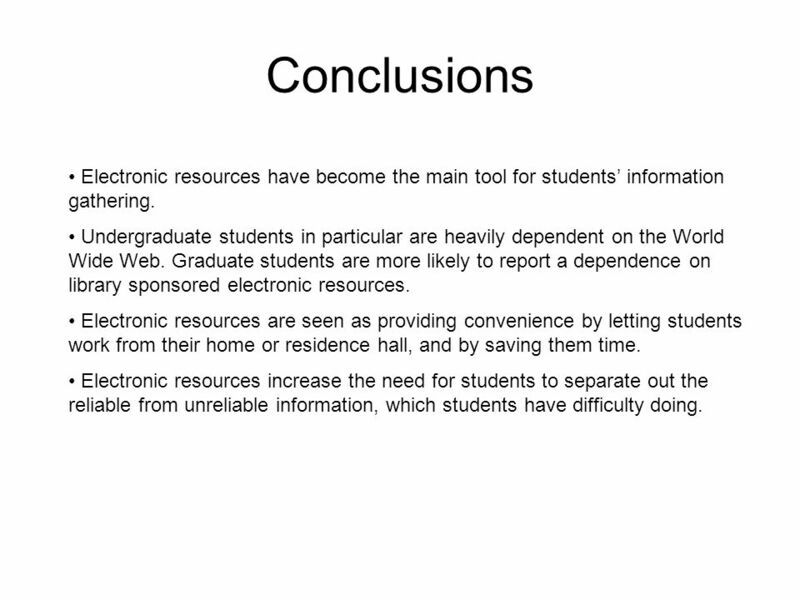 Electronic resources are seen as providing convenience by letting students work from their home or residence hall, and by saving them time. 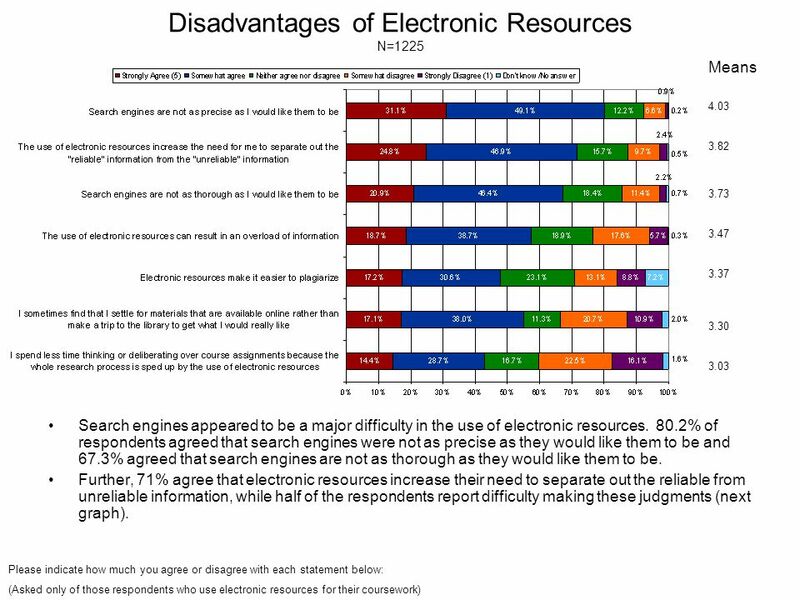 Electronic resources increase the need for students to separate out the reliable from unreliable information, which students have difficulty doing. 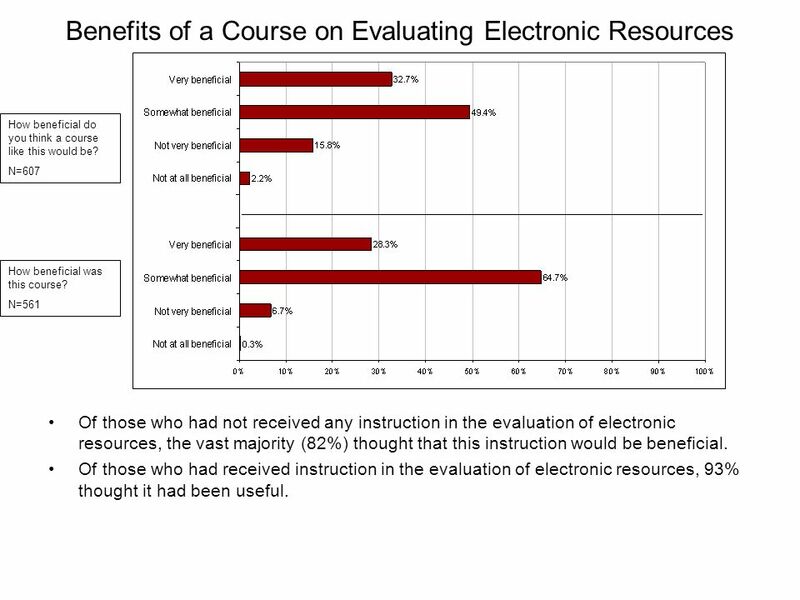 43 Conclusions (cont’d) Formal instruction on how to evaluate electronic resources would be beneficial to most students. 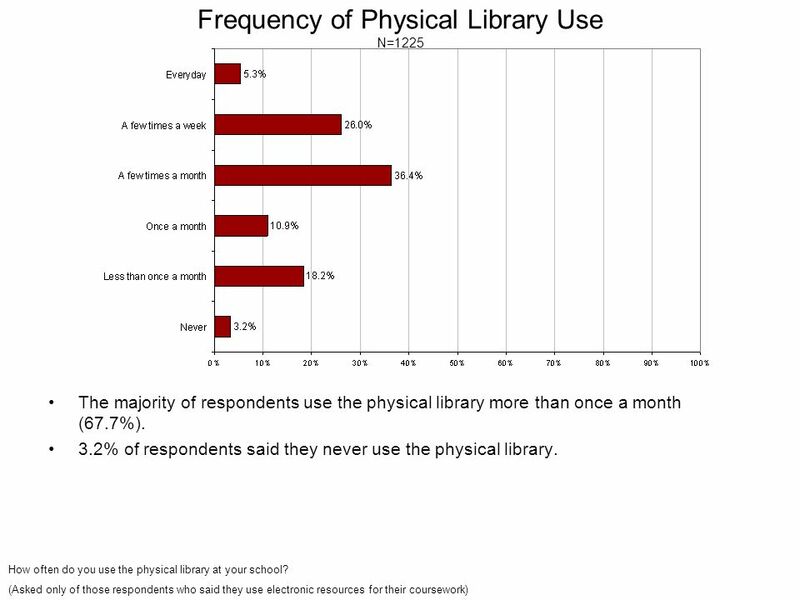 The physical library is still an important destination for students. 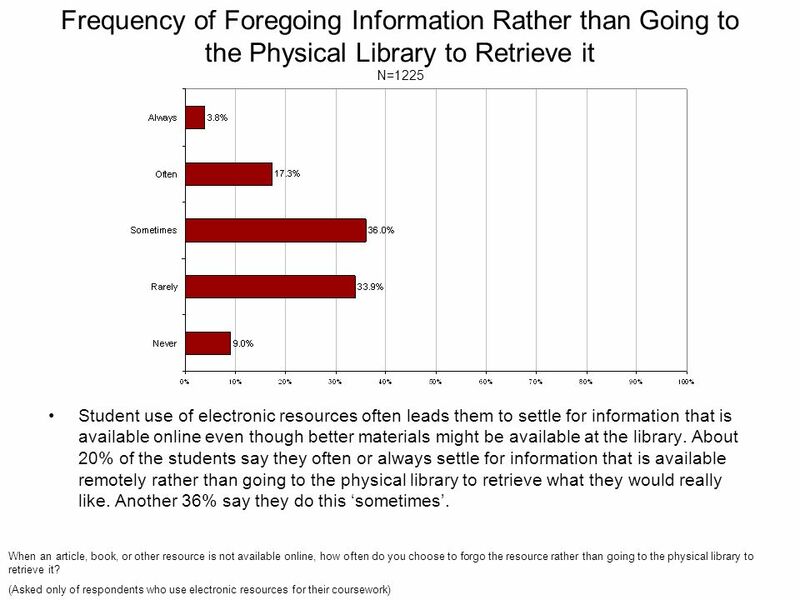 Both undergraduate and graduate students use the physical library to retrieve articles and books. 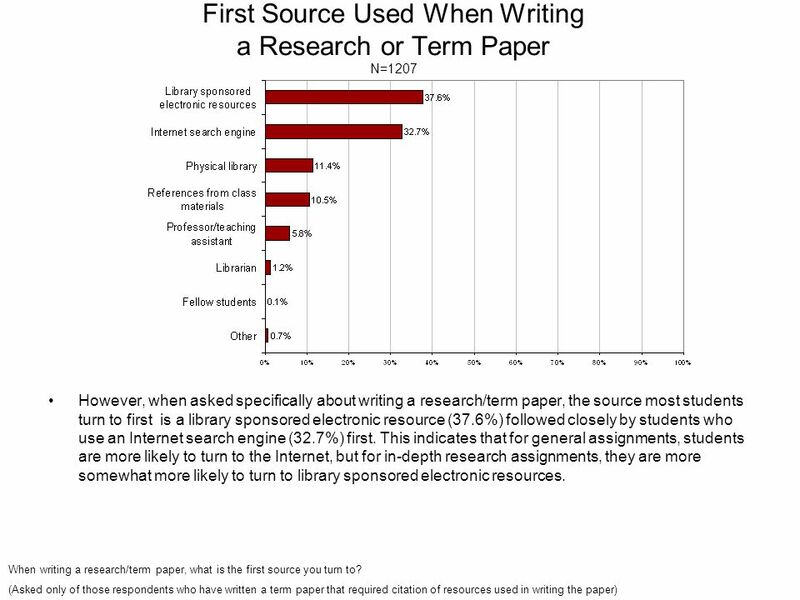 Undergraduates are more likely to use the library as a study space, for the computing facilities, or for Internet access. 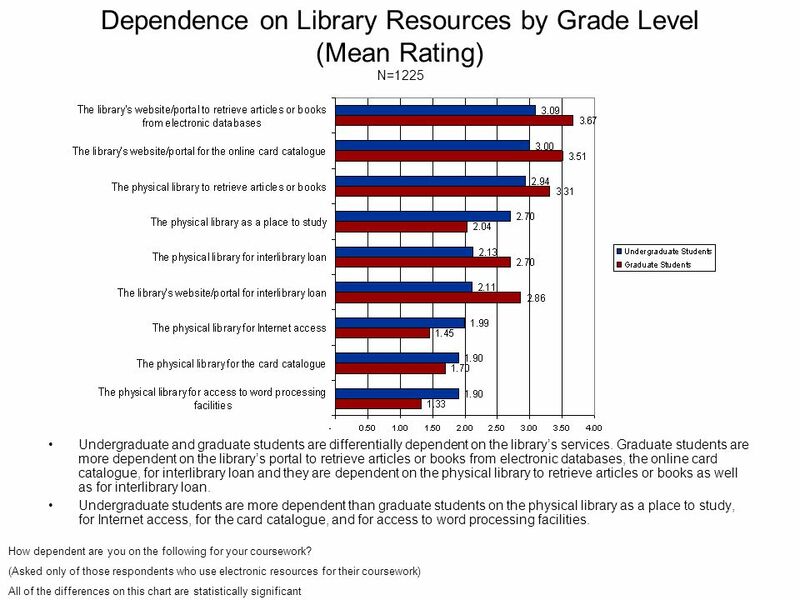 Graduate students are more likely than undergraduates to use it for interlibrary loan. 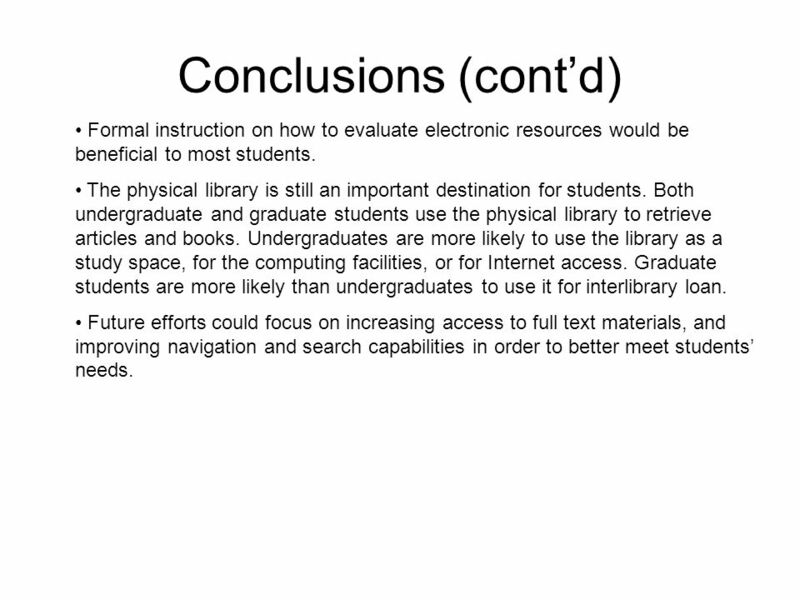 Future efforts could focus on increasing access to full text materials, and improving navigation and search capabilities in order to better meet students’ needs. 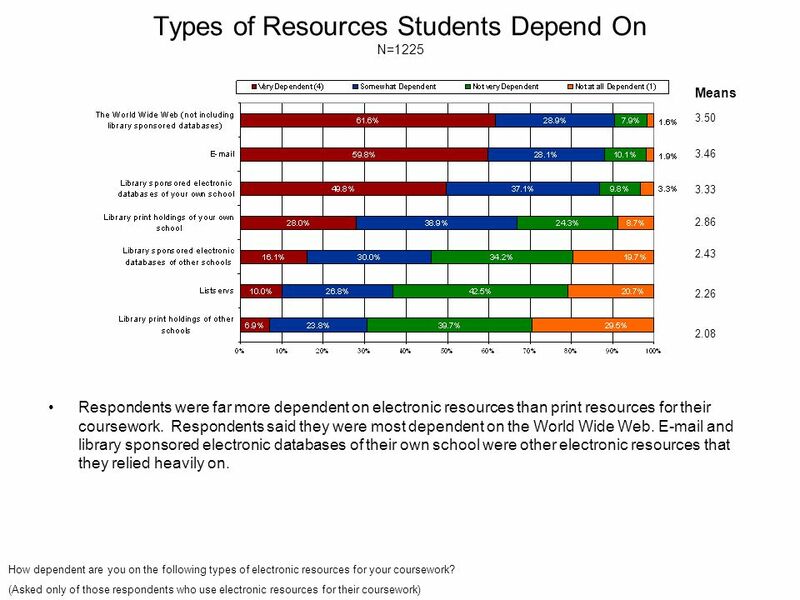 Download ppt "Student Survey 2003. 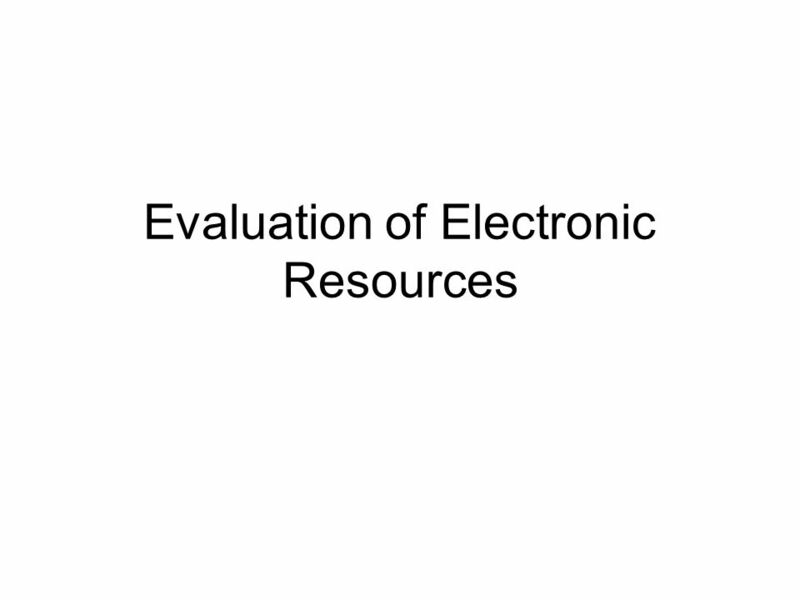 Table of Contents Introduction2 Methods3 The Sample4 Objectives5 Demographics7 Use of Electronic Resources for Coursework11 Advantages." 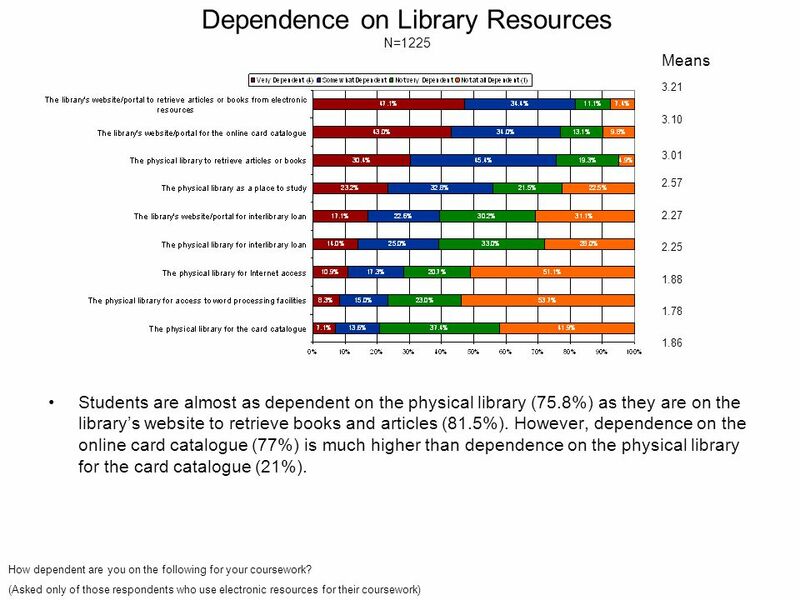 JISC Collections 24-Apr-14 | SOAS E-books Workshop | Slide 1. What Do Faculty Think of the Changing Environment? Kevin Guthrie Roger C. Schonfeld April 17, 2007.